Welcome to this weeks Trade Talk with destROY. This week I have written about a couple of guys who would round out teams quite nicely, including one big unit who I don’t think I have mentioned once this year. Personally, with 6 Hawks in my side and after climbing to 300th this week, the only trade I will be looking at is Alan Didak out (if not selected) in order to maintain some strength with the big dogs out. Quick thought: Pendles is on a run of 7 x 100+ scores in a row and has dropped under that mark on only 3 occasions this year. He has a very good run home, highlighted by a game vs the GC next week. If you have doubts on Gary, this is your boy. Quick thought: Who would have thought that the best big man in the comp leading into finals would be Big Mac?! Since returning to the side after being dropped he has averaged 116 in his last 5 and has not slipped under 100 in that time. He has a great run home including a game vs GC and we all know what rucks do to them. If you have spat the goo at Petrie, welcome Mac. Quick thought: Although he has not been in good form since the massive cork thigh he received, coming off a rest Colin must be considered on sheer potential and the added bonus of DPP eligibility leading into finals. Bar a tough game at Skilled Stadium he has a good run home which includes a game vs GC who he lit up for 132 earlier this year. Quick thought: Coming off a bye and fresh from his best month of the year, Pav looks set to finish the season well despite a reasonably tough draw. In the last 4 weeks he has a lowest score of 88, with 3 other score topping 100, highlighted by a 132 and 121. With the potential carnage caused by rested players in the lead up to this years finals, Pavs DPP and Fremantle’s need for him to play could serve teams well and provide the flexibility to avoid unwanted 0’s. This is the place to throw you trade ideas to the wolves and see if you can work out better alternatives. Good luck with the trades and an even bigger good luck surviving the wolves. So 4 out of the starting 22 plus smith who would usually be my first back up, is it worth burning a trade considering i only have 3 left or do i roll the dice and risk a possible 0? 6 trades left, $67,100 in the kitty. Want to upgrade swallow due to poor form and his finals bye. Best opinions, ideas or some feedback much appreciated lads! Stick with option 1 i recon, Thomas would be a awesome selection, at his stage of the year you have to look at those “unique” options for the edge, and his ability to bust out 113 with only 56% TOG on sunday shows the type of form the blokes in. Andrew Swallow has a BE of 120, with a moderate draw in the coming weeks. You probably need him to be gone by finals, and unless he can pull off something spectacular this week, he will continue to lose you money. Pendlebury and Thomas are scoring well, however they could be rested in the lead up to finals due to Collingwood’s dominance. Dal Santo, Thompson, Pavlich, O’Keefe and Redden are all good choices. You would need to wait two weeks at least before getting Ablett as his price will drop significantly over that time due to Saturday’s 23. In order to generate cash, you could downgrade Harris to someone like Callinan, as Harris is going to find it hard to get back in the team with Swallow and McKenzie rested and Bennell’s recent return. His only real opportunity to get back into the team, is if Ablett takes longer than anticipated to recover, or Iles is rested. You may also want to list your rucks, so we can see what downgrade options you may have. How many trades would be enough for finals?? Currently have 3 left. Want to get Daisy but would need to double as im short for Montagna. That would leave me with one. I have no Nth players, 2 Cats which I can cover with Callinan, Jacobs and or Nicholson. One blue with cover and no Bomber players. Would I be skating on thin ice with one Trade left??? Yeh 1 trade left and 8 weeks remianing will require alot of luck to go your way. Who would you be upgrading to Thomas? Either Krak or I. Smith?? anyone know whats going on with daniel harris? why isnt he getting a game? Luenburger or Sam Jacobs (Adelaide) or Mumford? Thinking of going Ablett > Redden should he miss this match or is it advisable for me to keep him. What do you think of my current team atm? Hey guys, looking for thoughts and any advice. Need to finish the last spot in defence and am looking at Fisher, Suckling or Birchall but with Hawks bye and all 3 having fairly big breakevens I will probably wait for that. What does everyone suggest?? Hi All – somewhat technical query. Looking at trading Lower or Duigan (6th and 7th defenders) to try to raise some cash for mid and forward upgrade (with Jacobs, Hibberd and some bloke called B Smith from Crows who was meant to be the next big thing – as bench support). Thinking of trading Duigan – finals bye – or should I dump Hibberd and accept $40K less? Secondly – as the person I downgrade to is unlikely to be required/play – any thoughts on just picking up an $80K’er? No one seems to discuss doing that on here. Any advice would be great. Cheers. I’m not sure who would be best to get rid of Hibberd or Duigan, but I’d keep Lower until Mundy makes it back at the very least. It all depends on how much you need that $40k, because in the end they’re both promising footballers. If downgrading, you could get either Warrick Andreoli or Rhys O’Keeffe, as they both at least have a chance of playing. Michael Coad is pricier at $112,400, but he will have an instant price rise, the first game back he plays. Daniel Talia is probably your best bet bet at $97,600, being a FWD/DEF, and having already got a 64 against Sydney. thoughts on petrie to Jolly? Holy crappola that is the BEST PIECE OF ADVICE i have seen on this website. you are a boss at dreamteam. The first trade allows me to put Heppell as my 8th back for bench cover so he can cover Gibbs’ bye while I he can be on the bench for his finals bye. The second trade gets rid of Zaha who has a GF bye but is in great form. In saying that, N Voldt’s b/e is only 39 and has 91 and 99 in his last 2. How do these trades sound? Should I trade in Voldt this week or later? Is trading in Jonathon Brown a good move?? He’s scored pretty well the last few weeks. Thinking of trading out Krak for him?? Thoughts??? What do people thinking about B.Harvey, down on points the last few weeks, possibly injured (thumb), finals bye. Would a trade to say O’Keefe make sense? Is Lower to Adcock and Krak to J.Brown good trades bad trades?? Need to finish the last spot in defence and am looking at Fisher, Suckling or Birchall but seeming as Hawks have the bye and all 3 having fairly big breakevens I will probably wait for that. What does everyone suggest?? $145k and 8 trades left. I’m only sitting 8th in the league so I’m prepared to use up another 4 trades before finals. What recommendations do you guys have for me? Boys, long time reader, first time poster. Just need some help with an issue that is keeping me awake at night. This means all cash reserves are gone but gets Dal Santo in before a likely hefty cash rise and gets rid of Darling who is losing cash by the minute. Also means hanging on to Dawes as a decent benchwarmer for finals post Rd 20-21. This means I wait until Callinan is back and get Pendlebury in time for his GC game. Bit of leftover cash as well. However, Pendles may be rested that game and means I’m keeping Darling for the rest of the year over Dawes. By the way, I’m only interested in leagues and have got 5 trades left and $93000 in the kitty. And keen to make one of these trades before Rd 18 as I’m up against my best mate in my league comp that week. I got 8 trades left and think of boosting my midfield to prepare for finals. already got swan, pendles, ablett, hodge and boyd. thinking to trade out dan harris for ian callihan. then kraks for another big high scoring mid fielder, who should that player be? wont have enough money for murphy or sam mitchell but have these players in available in dal santo, judd, scott thompson, priddis. who is the best and most consitent out of these? the most consistent out of those options would have to be Thommo from adelaide but nicky dal is having a bit of a purple patch at the mo. if it was me id go thompson. After picking cox and ryder at the start of the season, ryder was a major let down so i downgraded him to vardy and played smith for most of it, and up to this point was thinking he is good enough to shoulder the ruck duties in my team for the rest of the year, but with most of the teams positions settled im thinking he needs to be upgraded. i guess the question is, should i trade smith to one of these guys and if so, who? none of these ruck man are any good anyway, why not goldstein hes been averaging about 100 and dominates hitouts. I agree definately Shaw and Ablett will score and average more then Watson and Murphy. Also Shaw and Ablett are more consistant. Need to get Watson out of my side, so i’ll have 395k to get a solid mid. I am tossing up between Rischitelli and Embley.. Is there anyone else that would be better? (not including dpp) Cross, Wells, A Swallow and Goodes are other options. Help will be much appreciated. Cooney as an option back to his best. I reckon i will go for him this week. Well i have Rischitelli too, he is very consistant. Embley is also a good unique and played very well against the Cats last week. Should I trade in N Voldt for Zaharakis this week or later? Other: Very low b/e and no byes but would love to see him one more game to check his form. Is A. Krakouer to Kieren Jack a good trade? Single swap. Hey guys me again, sorry to be a pain just want thoughts on trades. 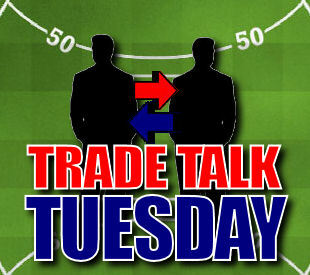 Is Tippett-Z.Smith then Montagna-A.Krak a good trade. Sorry just wanting some advice..
Hey lads I need some advice, I’ve got $265,000 in the bank with 6 trades remaining and thinking of trading Cam Richardson. Who for? You could get anyone, Depending on who you have and where you sit in relation to finals. I.E Geelong/Carlton players. The best value forward atm is Jack steven from STK IMO. Looking a ta donut in the forward line. Breust to Fyfe. Or Didak to ROK. No I was looking to upgrade Krak to Montagna? Is Z Smith to Tippett a good trade also.